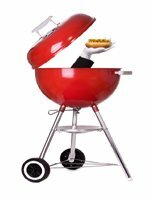 Many Canadians barbecue and grill year-round, a little snow and freezing rain's not going to stop these folks from enjoying their BBQ! 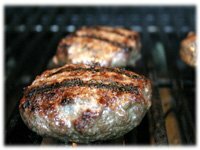 This Great Canadian Gourmet Hamburger recipe has been dedicated to the hardy, invincible spirit of those who call the Great White North their home. 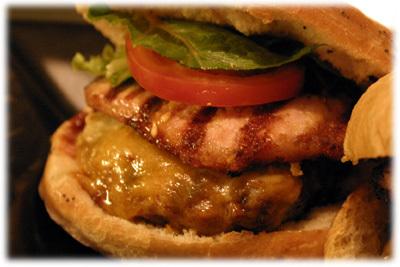 Made with genuine Alberta Beef this hamburger features a slice of grilled Canadian Peameal back bacon, pure Maple Syrup and is topped with Canadian Cheddar cheese. 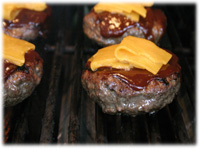 We also slather on our famous Smoky Maple homemade bbq sauce recipe just after we flip the burgers and add the cheese. Place the first 6 ingredients of this in a large bowl and mix well with your hands to combine. 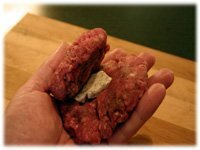 Wet your hands with water and shape approximately 1/2 cup of meat mixture in your hands into a normal burger shape. Don't overwork the meat as this toughens it and it will be anything but gourmet. 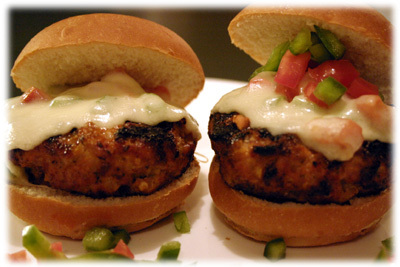 Place 1 tablespoon of this garlic butter recipe on the hamburger patty. 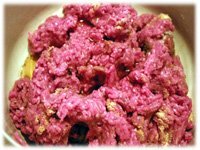 Take another 1/4 cup meat mixture and form a smaller patty. 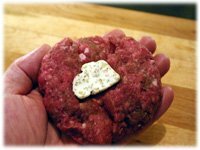 Place this over the first one and the butter so the butter is now inside the hamburger. Gently pinch the edges to secure the top to the bottom and to keep the butter inside. 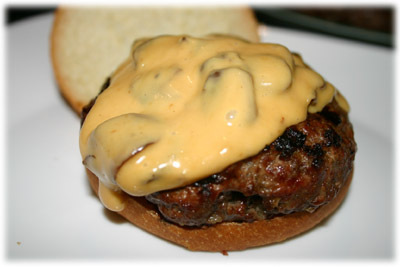 If necessary gently reshape the entire hamburger into a uniform shape. 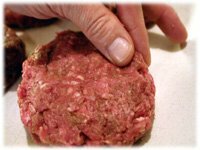 Make a slight indentation in the top of each burger in the center with your thumb - this counteracts the natural tendency of them to puff up while cooking. Clean and oil the grates and preheat your barbecue to 500F. Rub a little olive oil on each side of the peameal slices. 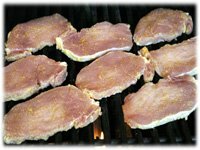 When the grill reaches temperature place the slices of peameal bacon on the grates and close the lid. Cook each side about 4 minutes. 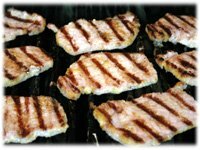 When cooked, remove the bacon from the grill, cover and set aside. Increase the temperature of the grill to 525F - 550F. 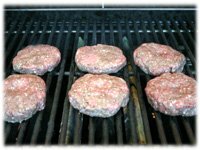 When the grill reaches this temperature range place the hamburger patties on the grill and cook about 6 minutes a side. When you flip the burger you should see nice grill marks. 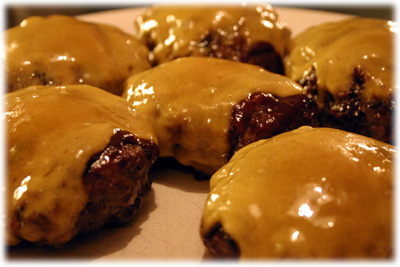 After you've flipped the burger slather some Smoky Maple BBQ sauce recipe on each burger and top with cheddar cheese. 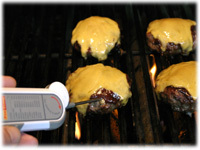 Insert the tip of an instant read thermometer into one of the thickest burgers. When the temperature reads 155F remove the burgers from the grill. They will increase a bit in temperature and should finish at a perfect medium. 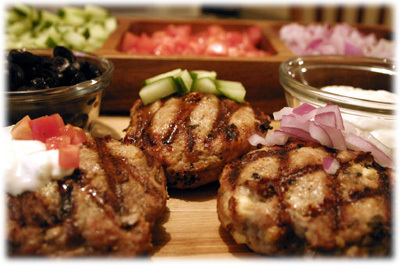 Remove the gourmet burgers to a serving tray and let rest. 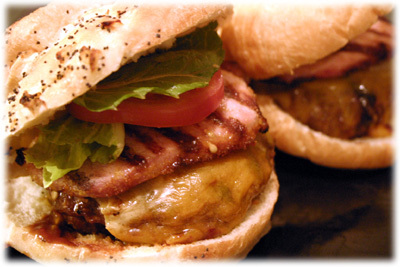 Serve with the cooked peameal bacon and a variety of buns or croissants. Suggested condiments include sliced dill pickles, onions, tomatoes, lettuce, and lot's of good cold Canadian Beer!